January 28, 2015: Update – The paper by Degen, et al described in this post has been retracted. The authors found that it was impossible in two cases out of three to tell the difference between a hydrogen atom and a carbon atom. This is because both carbon and hydrogen have similar magnetic interactions with NVs. The paper by Lukin and Park is still accurate, because the electron reporters are close enough to tell the difference. A hydrogen atom is about ten billion times smaller than your head and about 400,000 times smaller than the thinnest hair on it. The most powerful microscopes do not even come close to seeing one. Other imaging techniques like magnetic resonance imaging (MRI) do sense hydrogens, but only in groups of a million at the very least. It’s nearly impossible to pick one hydrogen out from a crowd. Nearly. In recent weeks two research groups have independently reported that they can detect a single hydrogen atom sitting on the surface of a diamond. In a paper published online in Science on October 16, Professor Christian Degen’s group at the Swiss Federal Institute of Technology in Zurich showed that they can pinpoint the hydrogen’s location on the diamond’s surface to within just a few nanometers. The research groups of Professors Hongkun Park and Mikhail Lukin at Harvard University take the same technique a step further. In a report published Monday in Physical Review Letters, they narrow a hydrogen atom’s location down to a couple of angstroms—about the size of a single molecular bond. Both groups rely on the presence of small defects in the diamond called nitrogen vacancies, or NVs, where two carbon atoms are swapped out for one nitrogen. The NVs sit just below the diamond’s surface and act as hydrogen detectors. When the scientists shine a laser on an NV, it will start sending out pulsing flashes of light in response. The pulsing will change based on the NV’s magnetic interactions with atoms and other particles nearby. “We can actually take each NV center and measure its individual depth below the diamond surface,” explains Alex Sushkov of Harvard, lead author on the study in PRL. Once they find an NV, they can then extract the distance between the NV center and the hydrogen from how long the pulsing continues and the frequency of the light flashes. 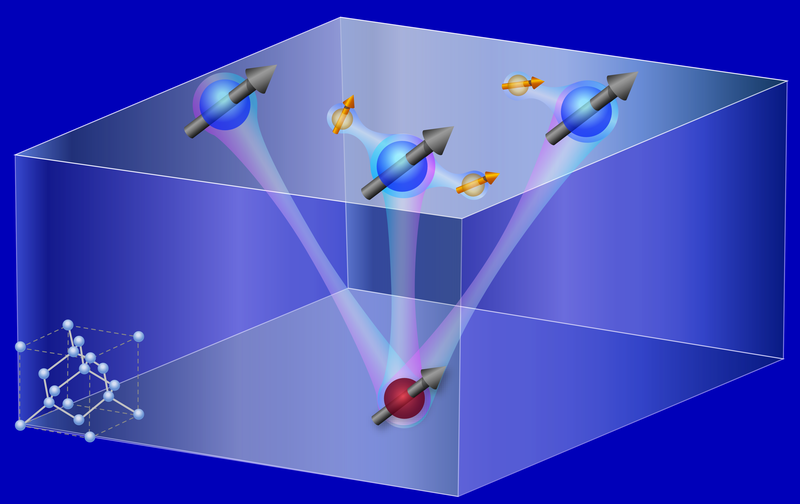 The Degen group looked at the direct interactions between a hydrogen and the NV, and based on these interactions were able to build a map for finding the hydrogen. In contrast, the scientists from Harvard looked at the interactions between the NV and a solitary electron reporter sitting on the surface of the diamond close to the hydrogen atom. “There is a limit on how close these NV centers can get [to the hydrogen],” says Sushkov. “But these reporters are right there, a few angstroms [away].” A hydrogen can barely manage a light magnetic tap, which makes it hard for the NV center to detect it if it is too far away. On the other hand, a free electron like the reporter packs a mighty magnetic punch that is easily felt by a far off NV center. One soft touch from a nearby hydrogen, and the electron reporter will pummel the NV to let it know the hydrogen is there. From the NV’s flashing response, the scientists can locate both the electron reporter and the hydrogen. ← How Does Your Mineral Garden Grow?